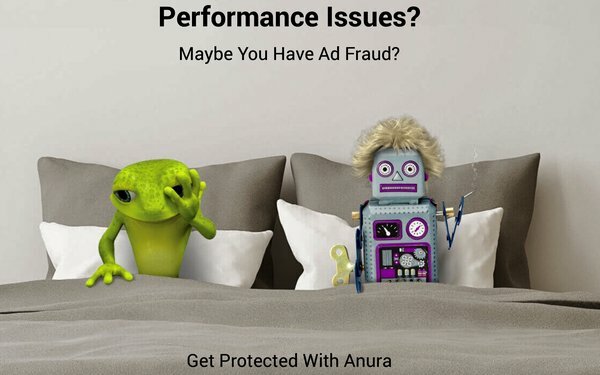 With ad fraud continuing to be a hot topic, Anura, an ad protection software company founded by advertising firm eZanga, is introducing a provocative campaign that links this deception with sleeping with someone without protection. The "Performance Issues?" creative is designed to "shock and amuse" by featuring the company's frog mascot Jimmy Hoppa in bed with a robot to illustrate the need for protection. From fraud, that is. "It’s a relatable correlation,” says Rich Kahn, chief executive officer/co-founder, eZanga. “If you don’t protect yourself, there are consequences [and] the same is true in the digital marketing space." The campaign was developed in-house with the original design for Jimmy the frog and robot created by eZanga's web designer, Ted Kolodzey. Using both AdRoll and Google AdWords, the campaign launched in advance of the trade show LeadsCon (going on now in Las Vegas), as a retargeting campaign with the intent to drive leads back to the Anura site. BusinessInsider.com, Newsweek.com, Cleveland,.com and HowStuffWorks.com are among the more than 1,600 websites included in the media buy. To further play up the campaign and the idea of “protecting your brand,” the company is distributing condoms and "performance enhancing pills" (i.e. breath mints) at its LeadsCon booth.